Pinnacle Jeweling Wax? Wouldn’t that be outside the system? Yes. You are correct. 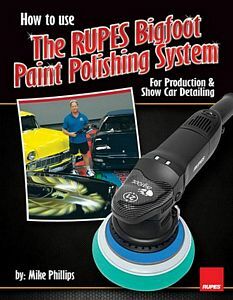 Using a non-RUPES product with RUPES tools would be absolutely considered working outside the "system". Thank you for pointing this out as it give me the opportunity to add and explain your comment to those that might not know what we are talking about. First - in the RUPES world, RUPES is a system, not a tool. That's why I titled my RUPES book the way I did. As a Veteran of the NXT vs Zaino Wax Wars - I don't type a single word that is not intended and has purpose. And when it comes to teaching RUPES as a system, I am the only NON-RUPES employee that is true to their brand. I ALWAYS teach RUPES as a system in all my car detailing classes. ALWAYS. I do this as a professional courtesy to Guido Valentini, the owner and President of RUPES as well as all his stellar employees. Below is Guido and myself at RUPES factory in Milan, Italy. In fact - I am very confident I have MORE RUPES detailing classes documented with pictures and the cool cars I use for my RUPES classes than any other Instructor outside of RUPES and even among all RUPES employees. There's a benefit to knowing how to work with pictures on the Internet as well as knowing how to write. I started creating a list of classes 4 years ago and have not updated it since. It would take me at least a day or longer to add all the RUPES classes I have documented to this list. Heck - even when Yancy and I went to Waxstock in England and I taught a Roadshow Class there I showed RUPES as a SYSTEM - This means I packed all the tools, pads and chemicals I would need and shipped them there and then shipped them home again. To test out the new Mark III polisher I didn't need to do a traditional 3-step all I needed was to buff out an entire car. The Corvette detail was a freebie for the owner letting us use the Vette for a video and because it was in very good condition, after washing and taking a BLACKFIRE Clay Mitt to the paint all I needed to do to perfect the paint was hit it with a quality cleaner/wax. Technically Pinnacle Jeweling wax is MORE than a cleaner/wax because Nu Finish is a cleaner/wax and it will NOT do to scratch-sensitive clearcoats paints like on this Corvette what Pinnacle Jeweling Wax will do so it's not fair to lump the PJW with Nu Finish and all of the other basic cleaner/waxes on the market. Here's my write-up for washing and decontaminating the Corvette used in this article. So yep.... went outside the RUPES system because at this time RUPES does not have a one-step on the market. I do know in time, this will change. Nice comment Mark, you enabled me to share a plethora of information. Sure, glad to. My goal is to always educate and I'm willing to put my experience and opinion on the front line for anyone to agree with or disagree with. I definitely true for some things. Not my gas tank or my bank account. When using a PURE wax or PURE sealant, in this context, the word pure means NON CLEANING. Then in this example you are SUPPOSED to be applying a product like Meguiar's #26 or Pinnacle Souveran Paste Was using the less is more technique BECAUSE the paint you are SUPPOSED to be applying these types of non cleaning products should already be in new, excellent or show car condition and thus all you're trying to do is lay down a thin uniform layer of product. So yeah, less is more. Overusing the product would be simply wasting the product. When using any quality cleaner/wax of as some of you like to call it, an AIO or All-in-One, you want plenty of what's in the cleaner/wax ON the surface WORKING for you. Thus you need the things I listed above working in conjunction WITH the pad, tool, time and technique to remove the defects and leave the surface both polished and protected. IF you underuse the product when working on this type of paint then you're diminishing the overall results you can achieve and investing a lot more time to get the job done. What I always write when talking about cleaner/waxes, or cleaner/sealants or AIOs or jeweling waxes, is you want to use the product HEAVY or WET --> this means you use plenty of product. You are not ridiculous and use so much product it's spraying and splattering all over the place, but you don't use 3 Peas Sized Drops. That would be ridiculous. And anyone telling you this is simply still learning. I actually met a recognized Pro Detailer a few months ago getting ready to start buffing on very neglected paint. Right in front of me he applied 4 peas sized drops. Still way to LITTLE product for the paint he was working on. I let him buff this first section and then wipe off the residue to inspect the results. He basically buffed to a dry buff due to so little product used. Keep in mind, anytime you buff to a dry buff on scratch-sensitive clearcoats you risk micro-marring the paint. That's working backwards in my book. Then I politely shared with him what he was doing and what he should be doing. He politely told me he was always told to use 3 pea sized drops. That's an example of bad information simply being regurgitated or parroted in the blogosphere and the results is everyone that is YouTube Trained & Certified simply don't really know what they are doing. I cover all of this in all of my classes, car detailing classes and boat detailing classes and with boats it's even MORE important to use a product heavy or wet because dry oxidized gel-coat absorbs some of the liquids in the product as you're working the surface so you automatically lose some original lubrication and chemical cleaners to the gel-coat. And same thing applies when working on oxidized single stage paint. Thanks you for asking! I hope my explanations make sense. 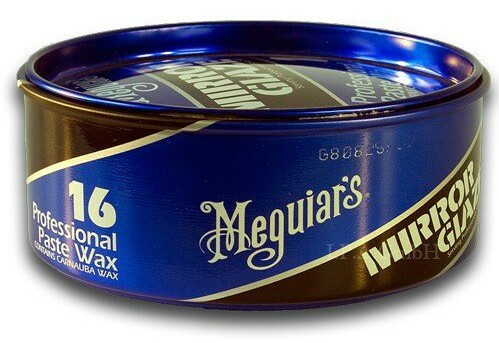 Just to give due credit where credit is due, it is Meguiar's that originally assocated the word PURE with non-cleaning polishes and non-cleaning waxes.